I hope everyone is having a wonderful Monday! I found it hard to get out of bed this morning (even though we slept in). Monday's always draaaaag. My OOTD Saturday was relaxed & comfortable. I had all of two hours of sleep Friday night (thanks to my two year old, Leighton) & was absolutely exhausted (hense the not so nice hair & glasses, haha). Here are my outfits from Sunday, Monday, & today! Tutorial: Mint Green Cut Crease! FINALLY, I got around to doing a tutorial (yaaaaaay!) I did a dramatic look using mint green & a cut crease. I really enjoy the way this look turned out, I hope you all do too! I'm off today, so i'm thinking about doing another tutorial :) Maybe something colourful, I don't know yet ... but stay tuned! Today I wore colourful & printed pieces. 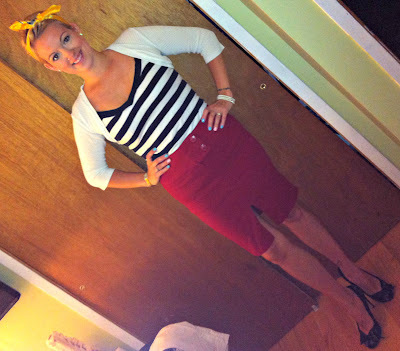 My outfit on Monday was very pin-up, sailor-esk (is that even a word? Haha). I thought it was cute! The other day I borrowed this shirt from my Mama & went with a "boho" inspired look for my outfit. I think it looked cute and it was definitely comfortable! I hope everyone has an amazing weekend; it's suppose to be a super hot one here!